2. Vascular Regeneration – Cyfuse Biomedical K.K. Currently, most patients requiring blood dialysis for renal failure use arteriovenous fistulae or artificial vessels for vascular access. 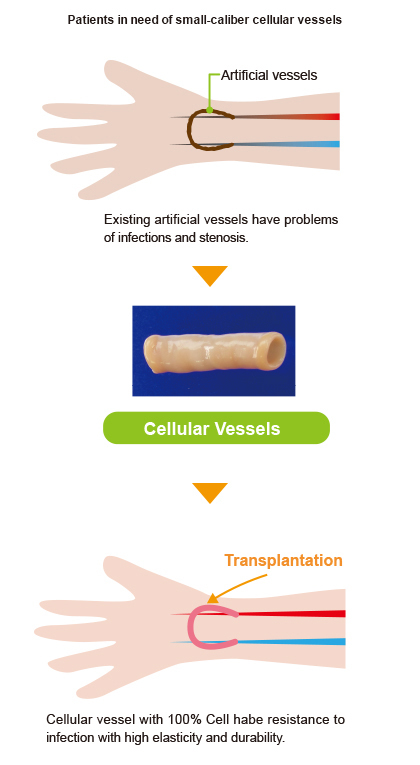 However, previous treatment with autologous vessels has limitations on the collection of vessels, and previous artificial vessels have been considered problematic because of the frequent problems of infections and stenosis since they are made of artificial materials. Currently, Cyfuse has successfully developed a steric vascular structure consisting of cells only with its unique three-dimensional cell layering technology without using a scaffold under the support of AMED. The previous research and development confirmed that this vascular structure created only from cells, such as fibroblasts, is strong enough to bear blood pressure and maintain a long-term aperture, and Cyfuse aims to start the clinical development under the support of AMED. From now on, Cyfuse is aiming to provide novel treatment for patients, including diabetics with angiopathy receiving dialysis by further advance development of this cellular vessel that are resistant to infectivity and have high elasticity. In addition to deployment of more difficult treatments, such as revascularization for severe ischemia in the lower extremities and coronary bypass, as well as expansion into the cerebrovascular field and pediatric vascular field, deployment into fields other than vascular fields is keenly awaited as well, such as the gastrointestinal and urinary organs from the progression of functional restoration technology using a tubular cellular structure created by cells only.